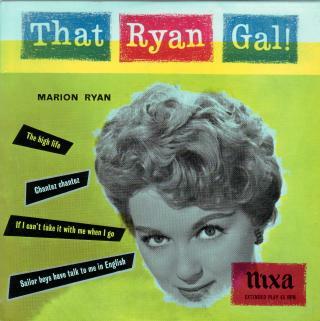 Marion Ryan was one of the most glamorous of the British singers of popular music to emerge during the 1950s. She could not only sing, but she looked good too. It was probably for this reason that she became a favourite with TV audiences. Her chart history is surprisingly modest and certainly does not properly reflect her general popularity. She was one among several female vocalists to find work with Ray Ellington whose combo would gain a regular weekly spot on radio's Goon Show some time later. As a result of this attention, she gained an opportunity to record and make numerous television appearances. Through the latter she became the resident singer on the musical game show "Spot That Tune" which would become one of TV's longest running series. Her recording career was less successful- probably because her output consisted mainly of cover versions of songs from the US with which the competition was unreasonably fierce. Despite this, her singles are all well crafted and her solitary #5 hit was well deserved. It can be argued that she was very much a product of the 1950s and although she carried on working with reasonable success into the 1960s, her style rapidly became anachronistic. Nevertheless she continued to be popular on TV and even had some success in shows in the USA. The EP shown on the left (NEP24041) has Marion singing in a variety of styles. In fact every track was recorded with a different orchestra and the disc goes some way in demonstrating the singer's versatlity. Her style on "Chantez Chantez" is reminiscent of Alma Cogan, whereas "If I Can't Take It With Me" draws obvious comparison with Eartha Kitt. By 1967, she married the American show business millionaire, Harold Davison. This doubtless gave her the opportunity to decouple herself from what might have turned out to be a fading singing career and she went into a retirement from which she would never return to foreground pop music. By the time of this second marriage, her twin sons, Paul and Barry- who had changed their surname from Sapherson (from Marion's previous marriage) to Ryan, had begun their own successful singing careers. Sadly, Marion Ryan died from heart failure following the onset of pneumonia a few days before her 68th birthday on January 15th, 1999. Note: 7N15151 was performed as a duet with Gary Miller.